The term biodiversity refers to the wide range of organisms—plants and animals—that exist within any given geographical region. That region may consist of a plot of land no more than a few square meters or yards, a whole continent, or the entire planet. Most commonly, discussions of biodiversity consider all the organisms that interact with each other in an extended geographical region, such as a tropical rain forest or a subtropical desert. Concerns about biodiversity are relatively new. Only during the last quarter of the twentieth century did scientists begin to appreciate the vast number of organisms found on Earth and the complex ways in which they interact with each other and with their environments. Biologists have now discovered and named about 1.7 million distinct species of plants and animals. As many as 50 million species, however, are thought to exist. 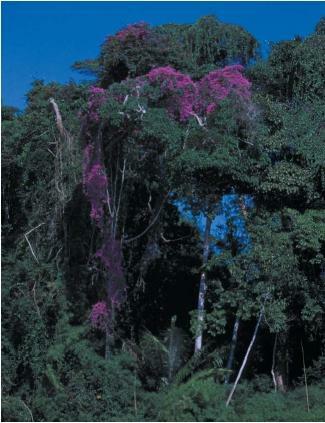 Biodiversity in the tropics is of special interest since the richness of species found there is so great. According to some estimates, 90 percent of all plant, animal, and insect species exist in tropical regions. At the same time, surveys of organisms in the tropics have been very limited. Those studies that have been conducted provide only a hint of the range of life that may exist there. As an example, one study of a 108-square kilometer (42-square mile) reserve of dry forest in Costa Rica found about 700 plant species, 400 vertebrate species, and 13,000 species of insects. Included among the latter group were 3,140 species of moths and butterflies alone. One reason for the growing interest in biodiversity is the threat that human activities may pose for plant and animal species. As humans take over more land for agriculture, cities, highways, and other uses, natural habitats are seriously disrupted. Whole populations may be destroyed, upsetting the balance of nature that exists in an area. The loss of a single plant, for example, may result in the loss of animals that depend on that plant for food. The loss of those animals may, in turn, result in the loss of predators who prey on those animals. As human populations grow, the threat to biodiversity will continue to grow with it. And as more people place greater stress on the natural environment, greater will be the loss of resources plant and animal communities need to survive. because they exist—have a right to continue to exist in their own natural habitats, untouched by human development. Second, humans depend on many of the plants and animals that make up an ecological community. For example, one-quarter of all the prescription drugs in the United States contain ingredients obtained from plants. And third, humans themselves benefit from the interaction among organisms in a biologically diverse community: plants help clean the water and air, provide oxygen in the atmosphere, and control erosion. "Biodiversity," according to the biologist Peter Raven, "keeps the planet habitable and ecosystems functional." One of the great issues in environmental science today is how biodiversity can be preserved both in specific geographical regions and across the planet. One proposal that has been made involves the use of ecological reserves. Ecological reserves are protected areas established for the preservation of habitats of endangered species, threatened ecological communities, or representative examples of widespread communities. By the end of the 1990s, there were about 7,000 protected areas globally with an area of 651 million hectares (1.6 billion acres). Of this total, about 2,400 sites comprising 379 million hectares (936 million acres) were fully protected and could be considered to be true ecological reserves. Ideally, the design of a national system of ecological reserves would provide for the longer-term protection of all native species and their natural communities including terrestrial (land-dwelling), freshwater, and marine (saltwater) systems. So far, however, no country has put in place a comprehensive system of ecological reserves to fully protect its natural biodiversity. Moreover, in many cases existing reserves are relatively small and are threatened by environmental change, illegal poaching of animals and plants, and tourism. The World Conservation Union, World Resources Institute, and United Nations Environment Program are three important agencies whose purpose is to conserve and protect the world's biodiversity. These agencies have developed the Global Biodiversity Strategy, an international program to help protect plant and animal habitats for this and future generations. Because this program began only in the late 1970s, it is too early to evaluate its success. However, the existence of this comprehensive international effort is encouraging, as is the participation of most of Earth's countries, representing all stages of economic development. very good information. very useful and easy to understand the text. very useful information,easy to understand, very good text. this is good and cool i would like to learn more and i agree with them very useful information, easy to understand, very good text. well, its very nice,meaningful and sensible text. I have really enjoyed to read it. I just want to be more aquainted with my environment. great job, keep it up. Is the survival of human beings dependent on biodiversity at all? I learned that biodiversity is endangered by environmental changes, illegal poaching, and tourism. People depend on some of the plants abd animals in the that maje up the ecological environment. For example, one-fourth of the prescriptions is made up of some of the plants.Finally, humans benefit from the interactions with the organisms. Plants can help clean the water, air, and help prevent erosion. Biodiversity keeps the plant ecosystem functional. Question that you are looking for I am so impressed in that situation. Did you know that biodiversity means the life that never ends of a living organisms on planet earth. my question is, what are the examples of biodiversity and what will be their occupation in the earth? This is very great information. I really enjoyed reading it. It really helped me with my homework thank you very much.